On the October 5th, in his hometown of Pancevo (as part of the series of events called GRRR Program) Zograf hosted a show dedicated to the 40th Anniversary of Monty Python's Flying Circus. The special guest was Charles Alverson, co-writer of the Terry Gilliam's movies, and a personal letter by Terry Jones to the Pancevo audience was read. The biannual magazine Gorgonzola, published by Mael Rannou, has printed a French translation of Zograf's story from the 90s, "Yugoslav Experience" - http://legouttoir.free.fr/ In Italy, it was Inguine magazine to publish Zograf's journalistic works - his interviews with Max Andersson, Gary Groth and Kim Thompson. An overview of this year's Tirana's Biennal has a merntion of Zograf's piece, as well http://www.tica-albania.org/TICAB/catalogues/en%20TICAB%20touitou.pdf , and the strips made after this trip were published both in Serbia (magazine Vreme) and Italy ( Internazionale). Zograf was one of the guests of a Balkan Snapshots - a film festival, held in Amsterdam.He did a slide show talk, speaking about his art, and the history of comics in Serbia in general. http://www.balkansnapshots.com/index.php?page=sasha-zograf . An important national daily NRC dediacted a considerable space to an interview with Zograf. In early December, Aleksandar Zograf was present in Beirut, for the exciting fisrt ever Comics Festival to be held in Lebanon. He gave a talk and a workshop at the Academie Libanaise des beaux-arts, and coordinated the workshop of the cartoonists from Croatia, Bulgaria, Romania, Slovenia and Serbia made possible by Next Page Foundiation from Sofia. Among the guests of the festival were the colorful, multi-national bunch including Charles Barberian, Pierre Duba, Saša Mihajlovic, Zeina Abirached, Paolo Bacilieri, Helena Klakocar, Elettra Stamboulis, Gianluca Costantini, and many others (see the information in French http://www.alba.edu/breves/09-rencontres-bd.pdf and Italian http://www.mirada.it/beirut.html ). 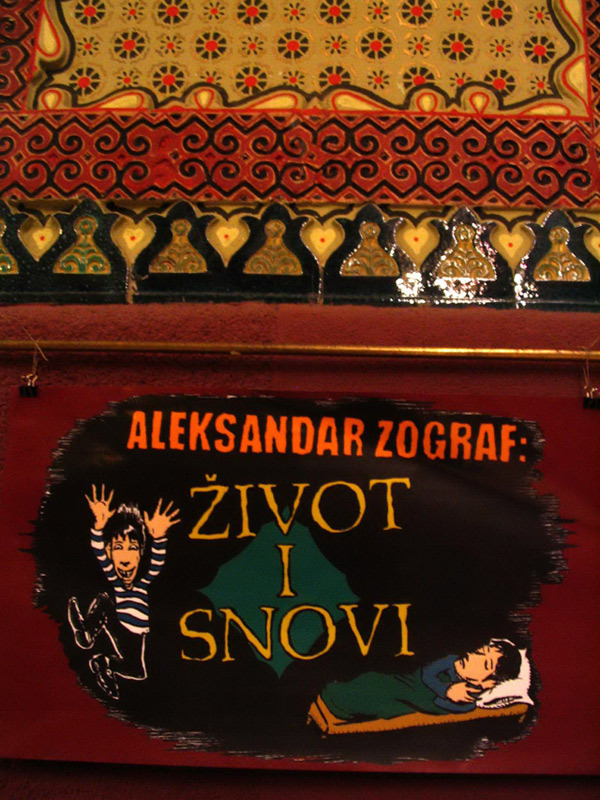 Together with Serbian comics historian Zdravko Zupan, Zograf edited a book tiled "Veljko Kockar - Strip, život, smrt" (Veljko Kockar - Comics, Life, Death), compiling all the works (comics and illustration) left behind by Veljko Kockar, Serbian cartoonist who published in the pre-war magazines, but also in publications coming out during the NAZI occupation, and who was shot by the new government in 1944, despite there being no evidence of his political or any other involvment with the Occupantion government. After his 2003 cameo appearence in the novel titled "Grad nadahnuce" ( Inspiration Town) by Serbian writer Jasmina Bogicev, Zograf got a mention in the short story "Ezekiel Rising" by American writer Jacob Russel. If you know any other piece of literature featuring Zograf, please write! http://www.fictionaut.com/stories/jacob-russell/ezekiel-rising . After the Brazilian comics magazine GRAFITTI 76% QUADRINHOS published two stories by Zograf, one of the country's most influential dailies, Folha de S. Paulo, ran an interview with him. What followed was yet another appearence of Zograf's stories (this time it was his TV Addicts series) in another Brazilian collection of comics and graphics - Favi de fel, from Rio de Janeiro http://www.favodefelcomics.blogspot.com/ An art show called SNOOZE at Manhattan's Scaramouche Gallery, which included Zograf's hypnagogic vision-inspired prints, was extended until August 30th. Reviews came out at Art Hag http://arthag.typepad.com/arthag/2009/07/snooze-group-show-at-scaramouche.html and in Italo-American magazine Oggi 7, to name but a few. Soon after Zograf presented his work in a gallery in Pirot, southeastern Serbia, a review of the Serbian collection of Zograf's comics originally published in Vreme weekly came out in Beton, which is a supplement of the Danas daily (in Serbian): http://www.elektrobeton.net/download/BetonBr76.pdf Zograf's activities in his native country extended to a small exhibition in a Library in Zvezdara, a district of Belgrade, and a workshop ( held at Elektrika, in Pancevo) that he conducted as part of the STRIP IT! project, which is a one of the largest comics workshops to be held in Serbia, with about 30 participants from Holland, Spain, the Czech Republic, Bulgaria, Bosnia and Herzegovina and Serbia. During September, Aleksandar Zograf visited Albania for the first time. He was participating in an Architectural workshop (!) curated by STEALTH (Ana Džokic and Marc Neelen, Rotterdam/Belgrade), all part of the Tirana International Contemporary Art Biennial. More about this can be read in the upcoming Zograf's comics travelogues... Speaking of exotic destinations, through collaboration with the Latvian comics magazine Kush!, Zograf participated to an exhibition of miniature drawings entitled The Last Match. The exhibition opened on 12th of September in an empty shop in Riga, and is supposed to travel to other festivals and galleries around Europe. http://thelastmatch.wordpress.com/ . Participants include Ben Katchor, Mark Newgarden, Max Andersson, Edda Strobl, Helmut Kaplan, and many others. The band has recently been produced by ex-Adam and the Ants members Marco Pirroni and Chris Constantinou. Another February event was the “Desimir Tošić” award given to Zograf in Belgrade for his weekly comic published in the Serbian independent political magazine Vreme. Soon after that, together with Andrea Plazzi, Zograf coordinated 'Nuvole e stampa'--an exhibition dedicated to the history of Italian comics--at the Italian Institute in Belgrade. A talk with Andrea Plazzi, journalist and publisher, a great connoisseur of comics (not only Italian), and former agent of the late, great cartoonist, Will Eisner, was also organized by Zograf in his home town of Pančevo. 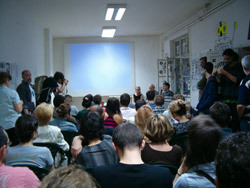 Part of NextComic was a lecture by Zograf delivered in the newly opened Ars Electronica Center. In late March to early April, Zograf was back in the vicinity of Lille. He conducted a workshop at Wattrelos’ Lycée Professionnel Savary. In April, during the Days of Serbian Culture in Ukraine, the Serbian and Ukrainian Ministers of Culture opened an exhibition based on Zograf's “Radoslav's Story”. Zograf could not be present in Kiev because he was touring several Italian towns in the province of Friuli for a series of events organized by enthusiasts and long time collaborators from the Italian rock band Arbe Garbe. Zograf gave slide show/presentations/talks/workshops in Trieste, Udine and Gemona. In May, Zograf was a guest of the Trenchtown-open air rock festival held in Serbia’s northern town of Subotica. 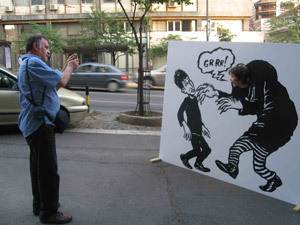 A few days later, as part of the Night of the Museum, an exhibition of Zograf’s works was opened in Galerija Službenog Glasnika in Belgrade, with a “Scare Zograf” panel installed in front of the gallery. Also launched was a new (hardbound!) 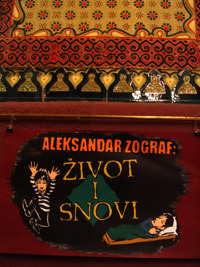 Serbian collection of Zograf’s Vreme comics called Polovni svet (Secondhand World). This was followed by Zograf’s appearances in several Serbian towns--Zaječar, Niš, Indjija and Čačak. SNOOZE is the name of a show, mainly concentrated around hypnagogic art currently on display in New York City’s Scaramouche Gallery from May 29th to August 1st. This exhibition, consisting of works by a number of artists from all over the world, is the appropriate place for Zograf’s prints inspired by his hypnagogic visions. In June, Zograf and Gordana Basta, together with Nina Bunjevac from Canada, were guests of Rome’s exciting CRACK festival, along with Vladimir Palibrk from Serbia, Chili Com Carne from Portugal and many others from all around the globe. To be added to the list of Zograf’s international activities are his pages published in the Brazilian "Graffiti 76%" magazine (together with another Serbian cartoonist, Maja Veselinović). Again, it was our friend Zograf who wrote an introduction to the comics segment of a nicely bound literary magazine Uj Symposion, published by the Hungarian community in Serbia. Also, later in June in Pančevo’s Elektrika, Zograf organized a workshop with participation by about a dozen other Serbian authors and Nina Bunjevac from Toronto. They all spent a day creating a jam comic based on the Serbian “black wave” feature movie from 1968, “Innocence Unprotected”. The legendary director Dušan Makavejev was a special guest of the event!